With the strength of the real estate market in Panama City Beach, there has not been a better time to buy a vacation condo or investment property. A vacation condo doesn't need to stay vacant until until you are ready for a vacation. For many PCB homeowners, your beachfront condo can make you some extra cash to help offset some of your investment. There is no reason your vacation property should not be generating cash-flow while your long term investment matures. Real Estate has proven to be a very solid investment move. There are more millionaires made every year in real estate than even the technology boom. Over the long term, it has been proven time over time that real estate investments outpace the stock market for generating wealth. There are many reasons that people choose to purchase a second home. With that being said, the purchase of a vacation home - which you can use as a family vacation spot, seems to be a great long term investment. Being able to enjoy beachfront views and take a walk on one of America's most beautiful beaches is just extra. Have a plan. Think about the options of renting your vacation home out for certain months. For Panama City Beach, the most popular time is Spring Break. It is very possible to make a large dent in the cost of owning your own Panama City Beach condo - if you are willing to part with it for that month. In addition to carving out an entire month, you can look into AirBnB for daily rentals. You will want to have a cleaning service available for immediate cleaning upon a tenant leaving, so factor those costs into your budget. Get a good REALTOR. When purchasing a vacation condo on the beach as a second home, you will want to have an experienced real estate agent that you can lean on. A seasoned agent that specializes in waterfront condos can not only help you find the perfect property, but they can assist with knowing how much revenue you may be able to generate while you are not there. The right agent will know which condos you should look into purchasing as each condominium complex has very specific rules and regulations. The last thing you would want is to purchase a condo only to find out they have restrictions on short term leasing. A specialized REALTOR can also help with any getting qualified contractors for any repairs. You may even want to utilize your real estate agent for managing the property if you are considering a long term tenant. Once you pick the perfect real estate agent, you will want to put them in contact with your mortgage lender. Its important that your agent and lender work closely together over the condo buying process. Get financing ready. Acquiring a mortgage on a property that will not end up being your primary residence is quite a different process than the mortgage you get when financing your home. Financing for a second home or vacation property may take longer than you are used to and they may ask for much more documentation and even a larger down-payment that you had in mind. This is why you want your mortgage broker to be chosen sooner better than later. If you don't have a good lender in mind, you can always ask your agent, they will know many good, local lenders and their reputation for getting the deal done. Find the perfect condo. There are many condos for sale in Panama City Beach. Take your time. Its important to remember that Panama Cit Beach's real estate market has been getting stronger every year. That means you may get discouraged by finding the most sought-after condos go under contract very fast. You will want to sign up for a system that notifies you the moment a new condo hits the market that fits your criteria. Lucky for you....you can sign up for that RIGHT HERE. You will want to stay away from sites such as Zillow and Trulia as they are well known for not getting the listings as fast as a local real estate website. You are also much more likely to be viewing a condo that has already sold. Only the local Panama City Beach real estate brokers have their websites updated on a timely basis. Also, there are TWO MLS systems in Panama City Beach. When searching for condos online, you will want to choose a website that gets listings from BOTH MLS's. Once again, we can provide that for you...RIGHT HERE. Lastly, when you are looking through listings online, you will want to keep an eye out for the condo's rental viability. Look for the condos located directly on the beach with not getting listing When viewing the newest properties, keep an eye out for the homes rental viability. Look for beachfront condos that are centrally located to many tourist locations. A couple great examples are: Calypso Towers Condos, Edgewater Beach Resorts and Majestic Beach Towers. Speak with your accountant. Purchasing real estate is a big financial decision. Although your real estate agent can make sure you get a great deal on the perfect condo, you should look to your accountant to structure the purchase of your new vacation home. There are many options, each with its own set of tax benefits. For instance, even though you can not get the mortgage interest deduction like you can on your primary residence, you can still take advantage of a variety of write-offs on your taxes. you Depending on your specific situation, you will have a variety of ways to structure the purchase of your new vacation home. Although the tax benefits are different on a vacation home than they are for your primary residence, you can still take advantages of may write-offs on your taxes. These are aspects of the sale you will want in place BEFORE you close on your new condo as in many instances, going back after can create new challenges -- depending on how you and your accountant have structured the purchase. Buying a vacation condo as a second home can be easier than you think. If done correctly, you can offset much of the costs of your new vacation home if you plan and execute properly. Do not get frustrated if the perfect property doesn't present itself immediately. Waterfront condominiums are in high demand in Panama City Beach and the best ones go fast. Look to your agent for guidance. When looking for the perfect second home in PCB, pay close attention to the potential marketing you would be able to do on each property. The larger complexes have already built brand names and are in constant demand. At the end of your journey, it is possible to grow your personal wealth while providing you and your family the perfect place to vacation and retreat to. It just takes a little patience. 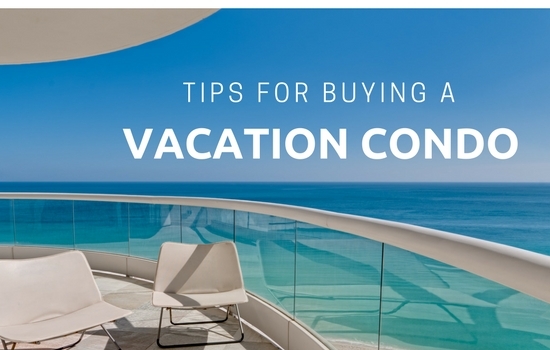 Ready To Buy Your Vacation Condo?